Fill a 12 hole cupcake tin with cupcake cases. Cream the butter and the sugar together until pale. Use an electric hand mixer if you have one. Beat in the eggs. 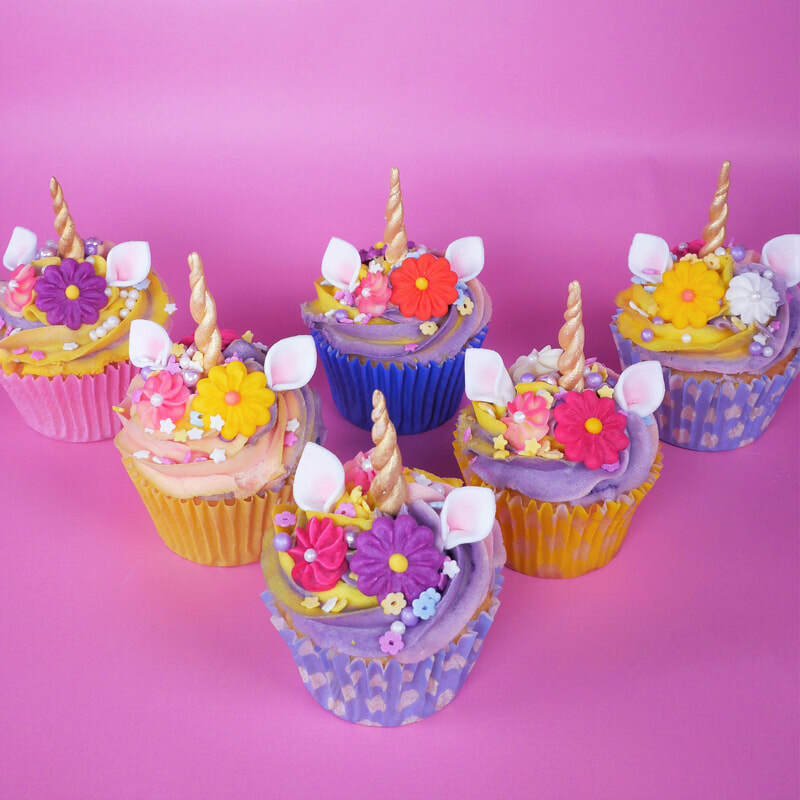 Place a spoonful of each coloured buttercream into one piping bag and pipe through a star nozzle. Make small ears using flower paste (we recommend cutting our small hearts, folding them and sticking them into the buttercream upside down). Allow to dry. This sets hard and the ears will stay upright. Use flower paste for the horn too. Roll out 1” sausage shapes with one end to a point. Twist the two sausages together to make the horn and dust with gold lustre powder. 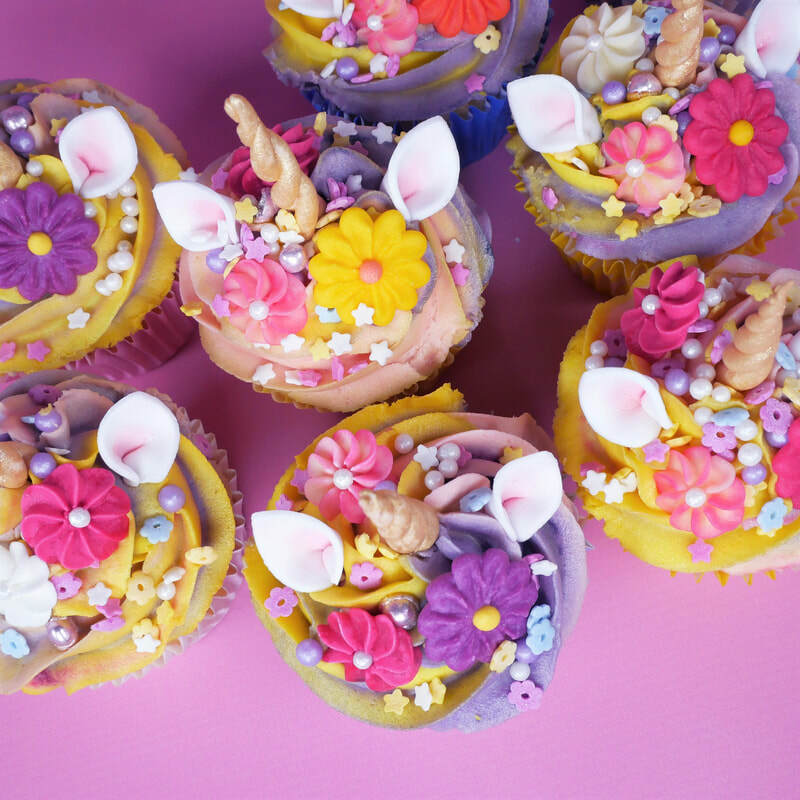 Decorate with Cake Angels Flower Power 2Ds, Pearl Swirl 2Ds, Blush Sprinkles and Carnival Sprinkles. Ingredients: RASPBERRY AND LEMON FLAVOUR SPRINKLES [Sugar, Glucose Syrup, Fruit and Vegetable Concentrates (Radish, Carrot and Blackcurrant), Glazing Agent (Shellac), Flavourings, Acidity Regulator (Citric Acid), Colour (Curcumin)], MULTICOLOURED CONFETTI [Sugar, Rice Flour, Cocoa Butter, Thickener 9Tragacanth) Colours (Camine, Mixed Carotens, Anthocyanins), Concentrates ( Spirulina, Safflower)], MILK CHOCOLATE JAZZIES [Milk Chocolate (Sugar, Dried Whole Milk, Cocoa Mass, Cocoa Butter, Whey Powder (Milk), Emulsifier (Soya Lecithins)), Sugar, Wheat Starch, Glucose Syrup, Concentrates (Radish, Lemon, Blackcurrant, Safflower, Spirulina, Apple), Glazing Agents (White and Yellow Beeswax)), STAR SUGAR SPRINKLES [ Sugar, Rice Flour, Cocoa Butter, Thickener 9Tragacanth), Concentrates (Sweet Potato, Apple, Radish, Cherry) Colour(Cucumin)] Milk Chocolate contains: Cocoa Solids 30% minimum, Milk solids 20% minimum. Allergy Advice: For allergens, including cereal containing gluten, see ingredients in bold. Energy 426kcal, Fat 6.8g, of which saturates 4.3g. Carbohydrates 90g, of which sugars 83g. Fibre 1.1g. Protein 1.4g. Salt <0.1g.